A recent Cornell study describes how Facebook users are increasingly dependent on its utility. In fact, the study asserts that users don’t leave Facebook for lack of utility: they leave for fear of addiction. While the propensity for Facebook to cause addiction is questionable, its utility most certainly is not. The Facebook ecosystem (which includes Instagram and WhatsApp) offer unprecedented social utility, and Facebook is expanding its native services substantially in 2016. The changes to Facebook in 2016 are new to Facebook, but aren’t new to the social landscape. Facebook appears to be borrowing the best aspects of other popular services and integrating them into Facebook as a central hub. For communication professionals, this means that the ways that you can communicate on Facebook are expanding and are increasing in complexity. Imagine a platform with all of the functions of Facebook AND Periscope, Yelp, Google, Yammer, Uber, Amazon Marketplace, Evite and Razoo…that is the scope of increased utility that Facebook appears poised for in 2016. One of the most talked about classes of mobile apps are live-streaming apps such as Periscope and Meerkat. Usage of these apps remains low, which may give Facebook Live Video an opportunity to become the go-to live-streaming app rather quickly. No additional app is needed to use this feature: the Live Video content prompt is located in the normal “Update Status” prompt in the mobile app. Introduced in August for public figures only (this service is called “Mentions“), Facebook has started asmall roll-out to US users, and just introduced the service to verified business Pages (to learn how to verify a Page on Facebook, click here). Expect the service to expand to more users in 2016 and for brands to begin experimenting with more live video content. Multiple studies have concluded that video engagement is higher on Facebook than on any other platform(including YouTube and Instagram), so this is something to pay attention to in the coming months. If you haven’t noticed, Facebook actively prompts you to review the places you’ve been. If you check in at or tag a location, odds are Facebook will ask you to elaborate about your experience…and (of course) this is purposeful. Facebook wants to be a recommendation engine. 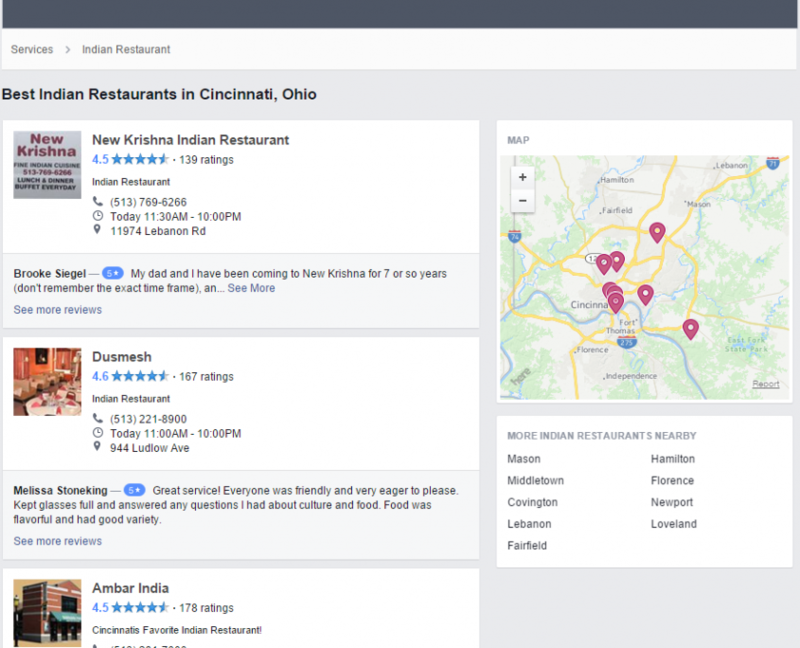 Mark Zuckerberg alluded to this right before he rolled out the first iteration of Google Search suggesting that a Facebook user could search for a sushi restaurant and get inferred recommendations from their contacts. Now it seems that the personalized recommendation may be generalized for a more Yelp-like experience.Facebook Professional Services recently did a soft-launch and the resulting product is currently more akin to Google reviews than to the robust reviewing community of Yelp. 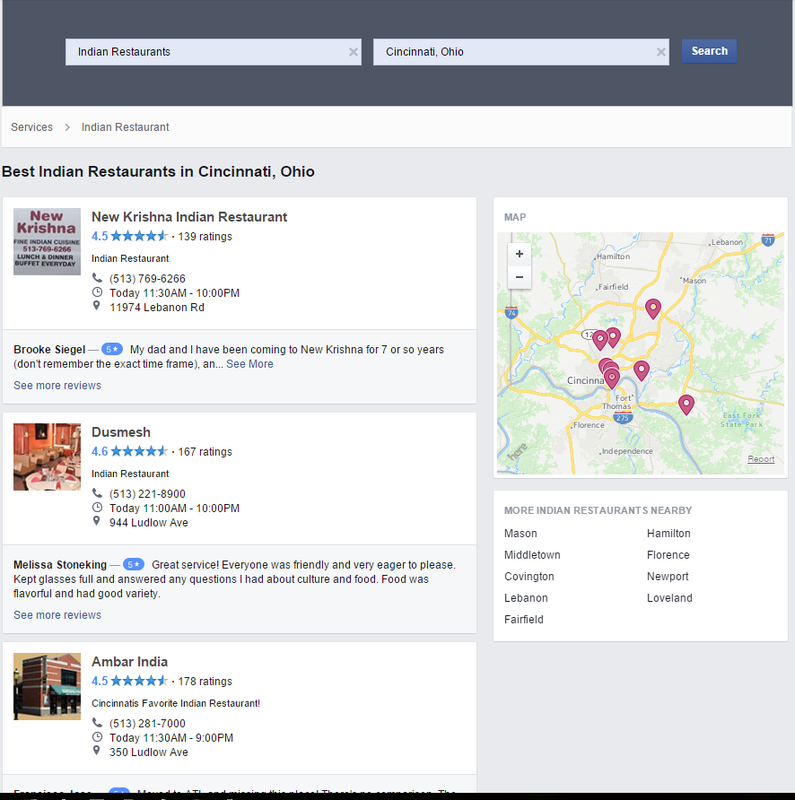 That said, the utility is evident and for my search (Indian Restaurants in the Cincinnati area), there were more Facebook reviews than Yelp reviews (Yelp’s stock price decreased upon announcement of this feature). Facebook at Work is Facebook’s (currently in beta) enterprise solution, and they have a pretty compelling sales pitch: an enterprise social solution with functionality that most people are familiar with. For communication professionals, this means that in the near future you may perform internal communication in a closed Facebook ecosystem. PR firm Weber Shandwick is one of the pilot beta testers and their initial impressions are that the Facebook at Work workflow isn’t as clearly delineated as it is with Yammer or Slack, though ease-of-use and scaled collaboration are aspects that are identified as its strengths. Expect a lot of emphasis on Facebook at Work, as stockholders envision higher profitably with a strong enterprise-level product. When Facebook quietly dropped Bing as the search provider powering Facebook’s Internet search, few people knew that Bing’s replacement would be Facebook itself. In October, Facebook rolled out an improved search function opening up all public posts as well asimproved intelligence to inform personalized results. For communication professionals, this means that public posts are more accessible to the Facebook community and that Facebook search may become a greater driver of activity in the future. Facebook recently announced integration of Uber and Messenger where users can now request an Uber ride through the Messenger app. Similar integration with Lyft is purportedly forthcoming. While the communication implications of this additional feature are probably slight, it’s worth noting that Facebook users may start using Messenger instead of the native apps to use these services. Back in July, Facebook added a “buy” button and allowed e-commerce partners to sell products on Facebook through Shopify. Even though the results of social shopping were disappointing for Facebook this year (as well as for Pinterest and Twitter), Facebook appears poised to expand their e-commerce offerings in 2016. Facebook has begun to roll out a shopping tab to a small number of users, with paid results similar to Google’s shopping tab. 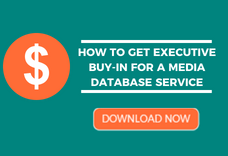 Communication professionals should be able to partner with marketers to leverage this feature for increased sales when it is rolled out on a greater scale. In May of this year, Facebook introduced Instant Articles for iOS, a feature that allows publishers to have their content distributed and viewed directly within the Facebook app. Just recently, Instant Articles was expanded to Android devices as well. A feature designed to mimic Snapchat’s agile, unique content (provided through publishing partners), Instant Articles can be viewed in nearly all mobile devices with great reach than Snapchat or the similar Apple News app. Along with Snapchat, Apple News and others, communication professionals need to understand that content may be consumed entirely on a third-party platform. This could have ramifications for measurement and monetization for branded content. Facebook Events has been around for a while, but has never been an especially popular or impressive aspect of the platform. Google Events (which was integrated with Google Plus before being consciously uncoupled) contrarily was very impressive although equally underutilized. For communication professionals that coordinate a lot of events, Facebook Events may be a straightforward and accessible way to manage them. There are a host of great crowdfunding sites, with varying degrees of distribution. For 501(c)(3) nonprofits, Facebook may become the best option for crowdfunding campaigns. Utilizing the Facebook “donate” button and Facebook’s platform and distribution, nonprofits may be able to fundraise more effectively on Facebook than with other crowdfunding sites. Communication professionals working with nonprofits should be aware of Facebook’s crowdfunding capabilities. Facebook recently rolled out their “Music Stories” feature, which gives users the capability to preview 30-second snippets of music from Spotify, Apple Music, Deezer, NPR and other sources. It is currently only available for iOS but will be available for desktop use soon. While this may be of nominal importance to communication professionals now, there has been some speculation that Facebook is interested in developing a streaming music product. Any communication professional tasked to distribute audio content (Deezer, for example, streams audiobooks and podcasts, although it isn’t widely available in the US market yet) may want to pay attention to this Facebook feature. There probably isn’t a more exciting social platform than Facebook right now. There are newer, shinier models, but none that can come close to the utility that Facebook has (and clearly wants to expand). Some of their innovation may be derived from other platforms, but as is evident with Live Video – adding Facebook’s distribution to a product gives it a lot more power. Hopefully I made the case that Facebook is a platform for communication professionals to keep up with in 2016. Despite its size and stature, it is one of the great utilities for communication and seems poised to increase its influence for the future. Meanwhile lets just say that we are proud JIm Dougherty contributed a whopping 4 entries.